Oh, the jealousy, the greed is the unraveling. It's the unraveling and it undoes all the joy that could be. Tears and fears and feeling proud to say 'I love you' right out loud. You could write a song about some kind of emotional problem you are having, but it would not be a good song, in my eyes, until it went through a period of sensitivity to a moment of clarity. Without that moment of clarity to contribute to the song, it's just complaining. You have this mounting aggressive ignorance with the rabbit's foot of their particular religion. You don't really have any kind of spiritual law, just a kind of a rabid mental illness. The songs are a little slice of life. You know, Neil Young is singing Rock n' roll will never die, and Neil never rocked and rolled in his life. I mean, he rocked, but he didn't roll. He has got no swing in him. Buddy Holly and the early rock 'n' roll was no lighter than the way I play. It's very minimal. New Updates! (4/26/2019) We've been working really hard on completing our membership system so you can submit quotes and keep track of them. Once this is complete in the coming weeks there will be a lot more quotes by Joni Mitchell and other authors. 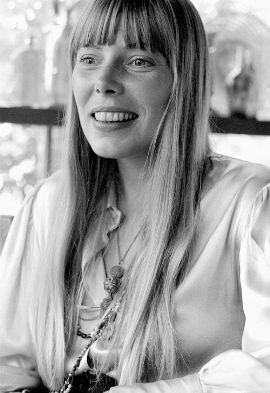 We've also changed the sorting on the site so you now see the latest Joni Mitchell quotes first. Our goal is to have the best Joni Mitchell quotes on the web!